marlene b. creative: Ginger: Gin-Gin Martini. My earliest memories of ginger include the nose-tingling sensation of Vernor's Ginger Ale and my Mother's dinnertime warning to not eat any ginger slices hidden in the stir-fry. My love of ginger grows each time I taste it used in a different way. If it's on a menu in any manner I will try it. Four or five years ago I went to a Seattle restaurant with a friend before attending the ballet and with a little hesitancy ordered their Gin-Gin Martini. It has been my favorite cocktail ever since. I began making it at home using store-bought ginger vodka, first with a Polish rye version, Alchemia Imbirowa, and when I could not find that, Skyy Ginger Vodka. The Alchmia was decent but eventually it became unavailable; Skyy was better than nothing but certainly lacked a true ginger root essence, tasting more of ginger ale syrup than the real thing. Dissatisfied with the ready-made options I decided to make the ginger vodka myself, not actually distilling it of course, but by simple infusion. It was insanely easy and I could not believe I wasn't making it all along. 1. Find a piece of ginger root with maybe 6 or 7 inches of usable pieces; it is better to infuse too much than too little because you can always dilute it down to your preference. You don't have to remove the outer skin but it makes a more clear final product so I always do; use a peeler or a small knife (very carefully). Slice the root across the grain into discs about 1/8 to ¼ inches thick. This isn't science, you don't have to measure, but you want to take full advantage of all the glorious ginger flavor. Once cut you should have a hefty handful of sliced ginger, maybe 1 ½ to 2 cups. 2. Put the sliced ginger into a pitcher and pour the vodka in. Place the pitcher into a refrigerator for at least 2 days, I've left it in for up to a week. 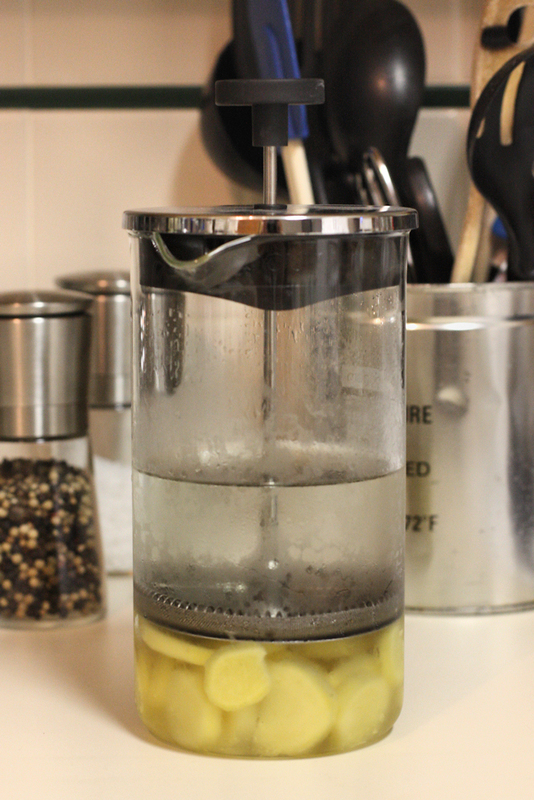 Soaking ginger in alcohol is actually one way of preserving it so I wouldn't worry about the time on the long end. 3. Using a mesh strainer and a funnel pour the infused vodka back into the original bottle. I store the finished product in the refrigerator, it just seems better. If you are infusing less than a bottle it is very convenient to use a coffee press because then you can skip the strainer and funnel and simply pour directly from the pitcher. 4. (Optional, but highly recommended) Save the ginger from your infusion and store it in the refrigerator, I use a glass bowl covered with plastic wrap. As I mentioned earlier, it is actually preserved and can be re-used. Most often I use it in strir-frys but it is certainly not limited to that. Finally, you now have ginger vodka and can make your own Gin-Gin Martini. Yes, I know it is not technically a martini, but since it contains only spirits I let the term slide on this one. In a cocktail shaker add ice and spirits. Shake or stir (pref.) until well-chilled, the colder the better. Strain into small cocktail glass. 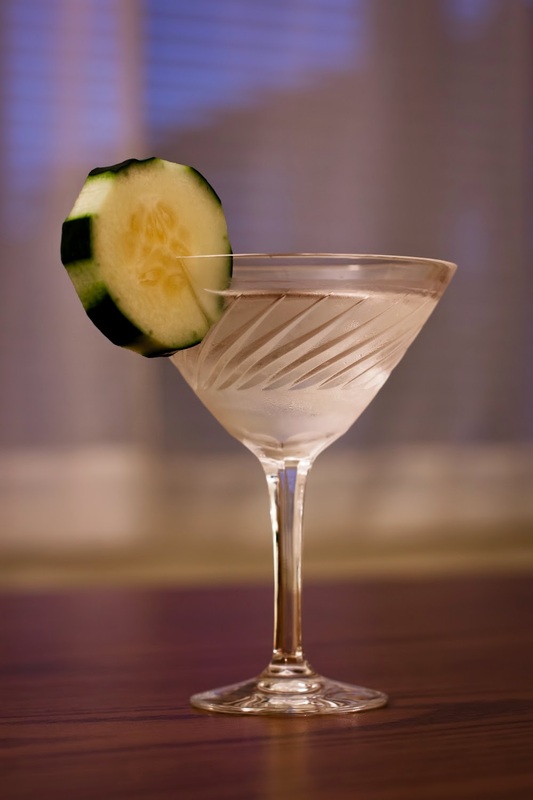 Place cucumber slice on the rim. Enjoy.